The Distinguished Service Cross (DSC) was established by order of President Woodrow Wilson and was born as part of the new Pyramid Of Honor that was established during the 1917 review of Medal of Honor awards. 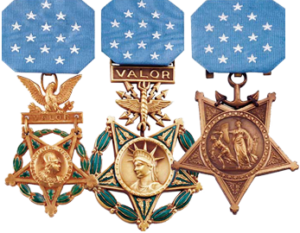 Prior to establishment of the DSC by virtue of War Department General Orders Number 6 of January 12, 1918, and by Act of Congress on July 9, 1918 the Medal of Honor was the only American award for valor in combat available to American servicemen. The Distinguished Service Cross has been in effect since April 6, 1917; however, under certain circumstances the Distinguished Service Cross may be awarded for services rendered prior to April 6, 1917. It is the highest U.S. Army award that can be awarded to civilians in service to the military or to foreign nationals. Even in these cases, the criteria for award are the same. While serving with a friendly nation engaged in armed conflict against a force in which the United States is not a belligerent party. Authorized February 4, 1919, the Navy Cross was the Navy's 3rd highest award for combat heroism and other distinguished services. On August 7, 1942 Congress made the Navy Cross a COMBAT ONLY decoration with precedence over the Distinguished Service Medal, making it the Navy's 2nd highest award ranking below only the Medal of Honor. It shares this position with the Army's Distinguished Service Cross and the Air Force Cross. The Air Force Cross is the Air Force's second highest award for valor. Only the Medal of Honor ranks higher in order of precedence. It shares this position with the Army's Distinguished Service Cross and the Navy Cross. Home of Heroes continues to update our website content for online visitors. Here is a resource that can help you find a United States military Service Cross Recipient. This information is provided in a PDF document which enables you to search the content by several search terms - name, branch of service, war/conflict.